Severe Weather targets region from Dallas to DC this afternoon/evening, A very warm Easter Sunday from Brownsville to Boston! Throughout this evening an area from northeast Texas, Oklahoma, Arkansas, southern Missouri, western Tennessee, western Kentucky and up into southern Illinois and Indiana, northern Virginia & Maryland will likely see and are currently seeing thunderstorms develop along a stalled frontal boundary associated with a developing low to the lee of the southern Front Range/High Plains. The danger is that as the air remains hot and humid into the early evening, out ahead of the front and the front then shifts eastwards, this then forces overriding cool air over top of the bouyant warm, humid air increasing the chance that these developing thunderstorms this afternoon will become severe and of course may produce tornadoes. As you can see from the above doppler radar, areas west of Dallas are seeing strong storms, same for areas south and southeast of Oklahoma City. Unfortunately, there are powerful storms in progress marked by the ‘red box’ over northern Arkansas. There are more strong and likely severe thunderstorms blowing up across western Kentucky at the moment and more will develop as the moisture flowing along the eastern side of the boundary is piling up and getting sucked inwards and upwards into giant cumulonimbus towers. 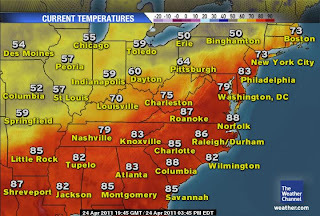 Later today and through tonight, areas from Kentucky eastwards into Maryland and northern Virginia may see and are currently seeing storms blossom with temperatures in the 80s. Tonight may see large urban areas such as DC and Baltimore at the mercy of strong to possibly severe thunderstorms. 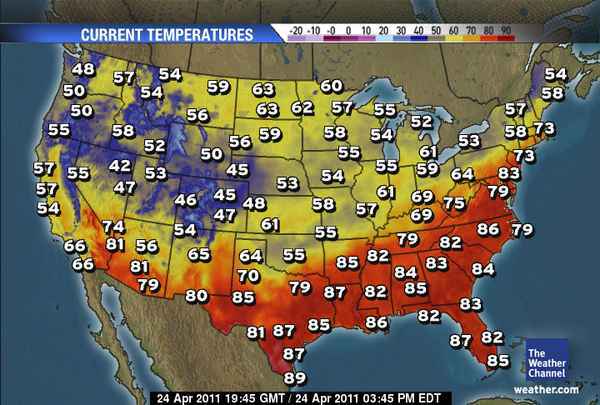 Here’s a look at the temperatures seen this afternoon. Note the the graphic immediatly below, the cool air covering a large swath of the country but very warm air over the south and east, where the front has yet to get to. 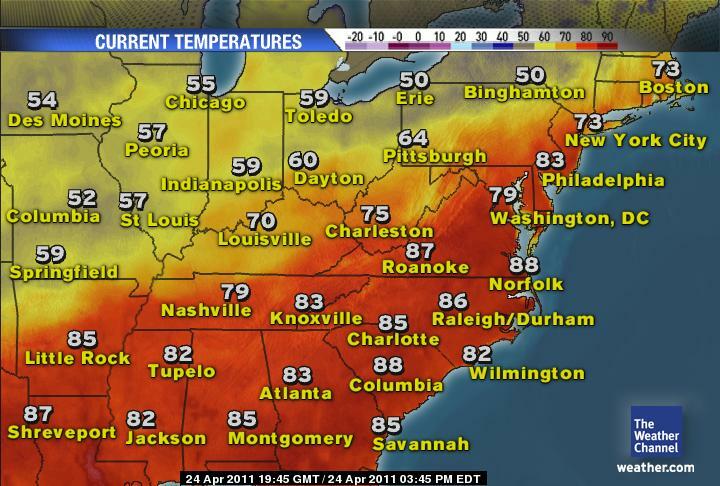 This heat and humidity is the very juice that could fire storms to severe storms later this evening. 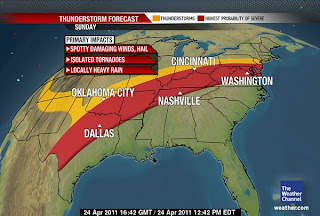 The below graphic shows where The Weather Channel are suspecting severe weather to possibly develop. One must also consider the fact that not only is there a major concern with tornadoes, but the fact that the front has stalled out means storms will fire and run northeastwards. The persistency in redevelopment in these storms as one leaves and another then fires up where there is a space left behind by the other means torrential and persistent rains create a high chance for major flooding. Today, tomorrow may see a further 3-6 inches of rain over an already soaked area across the lower and mid-Mississippi valley. 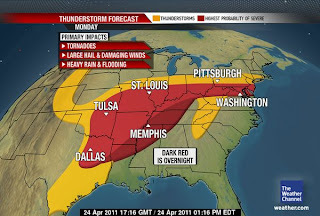 The below graphic shows tomorrow’s risk of severe, tornado-producing storms with the dark reds illustrating nighttime risk. After yesterday’s scorcher across all areas of England and Wales, leaving Scotland out in the cold with highs reaching a very respectable July or August 26.1C as far north as Coningsby, Lincolnshire, only .1C away from tying an all-time April maximum and 25C recorded in Leconfield, Yorkshire, today saw more clouds and a widespread trim back of 2-4C, with some 6C off yesterday. This was caused by the front that has erased the warmth over Scotland, penetrating deeper into England. A large swath over the north and the Midlands saw a solid 4 or 5C departure from yesterday with a similar story yesterday over Scotland from the previous day. It’s all part of a deepening trough digging into the northwestern UK, dropping pressures and cooling the upper levels. This cooling of the upper levels forces cloudcover formation where there’s lower pressure and rain always gets transported in from the N. Atlantic. The ability for the sun (when it’s shinning) to heat the ground is much less than 30 hours ago. LONDON AND SOUTHEAST CORNER REMAINS WARM INTO EASTER MONDAY! The one place that almost always sees warmer and sunnier weather, southeast England and Greater London, and they will continue to see the best of the sunshine and warmth. Today appears to have seen most areas across the region drop 2-5C off yesterday, however, even though pressure heights are less here and it was cooler, one must remember that for Londoners, an unfortunate drop in temperature means only 22 or 24C (72-75F) today with still SUNNY skies, rather than the toasty 25, 26 and 27C of yesterday.. oh, aren’t you guys hard done by eh! As for tomorrow, highs will be slightly milder over Scotland with 15 to 17C (58-61F) expected under sunny afternoon skies, today was mostly cloudy and highs were only at 10-13C (50-54F) for most. North and central England will see a further trim in temperature from today’s 18 to 21C with an increase in cloud and possible showers as the air flow continues migrating south, pushing the high further back into mainland Europe. Highs will range from 13 to 17C tomorrow making it noticably cooler across the region. If one goes by eerily similar water temperatures in the Gulf of Mexico, the type of tornado/severe weather season we’re seeing and the overall pattern across the US, then one must be concerned about the upcoming hurricane season as there is striking similarities to the years 2005 and 2008 to this year so far. 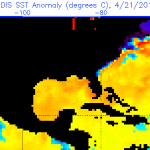 Going purely by current SST’s (Sea Surface Temperatures) in the Gulf﻿ of Mexico, note the 2005, 2008 and compare those years with this year. Their all very similar in terms of a wide coverage of above normal temperature across the basin with this year arguably the warmest ‘net coverage’ of the entire basin. The fact that we’re seeing a classic La Nina upper-atmospheric pattern over North America like in 2005 and 2008 with colder than normal conditions across the Northern tier and warmer than normal conditions across the southern tier which supports a stronger than normal Jet Stream of which lows are forming along with the development region being over both the Gulf of Alaska and on the lee side of the southern Rockies, this is all too similar to 2005 and 2008. My worry is and I know other forecasters share this concern across the board, that with a tornado season similar and if one goes by a classic La Nina season, then May will turn out colder than what we’ve seen in April when comparing to averages, but despite a larger area of below normal likely in May across the Lower 48, the heat will hold across the southern tier. 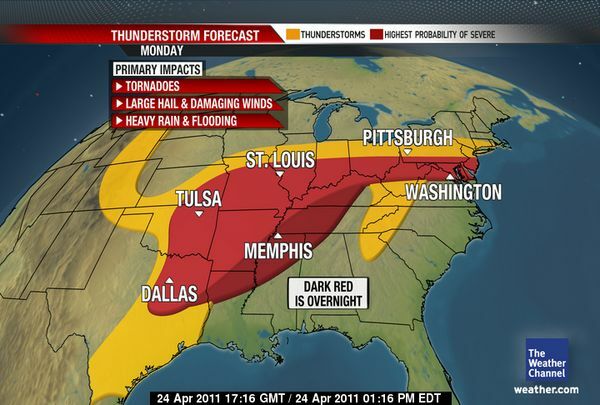 This of course doesn’t bode well for the severe weather season through May. 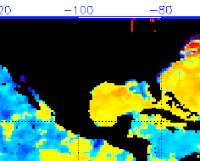 It also means that the Gulf will continue warming. 2005 and 2008 were big landfall years in the United States. This summer ahead if going by the years being looked at, won’t be a particularly hot summer with troughs regularly dropping into the midsection and east, with ridging over the West. It’s likely going to be a hot year for interior California, Nevada, Arizona, Utah, Colorado. Unfortunately, I do believe that the US is overdue another big hit and this year could be the one, since the pattern is the way it is and waters are ripe for intensification. 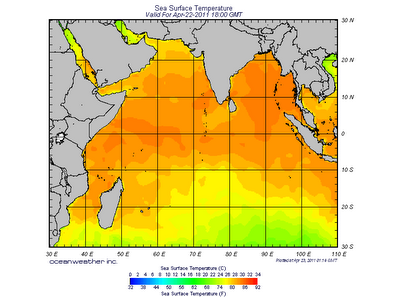 Continuing from MW-2, “Bay of Bengal” low pressure parameter is a worrying factor. Normally, the Bay should host a pre-Monsoon low anytime after 15th. April. Like I mentioned in the previous MW, last year we had a cyclone in the Bay by the third week, and in 2009 a cyclone crossed the Bay on 12th April. As on today, this region still maintains a luke warm response to the formation of a quick low. The pressure is anything but low, and the winds indicate a weak “high” trying to establish itself. 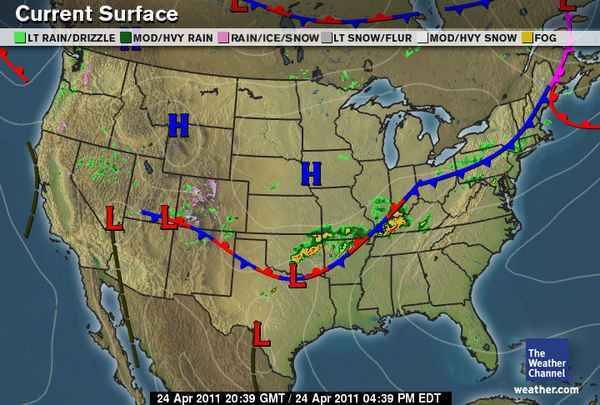 What is needed now are winds getting Easterly, to start with, and break up the existing high pressure area. 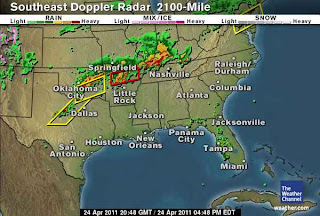 Severe Thunderstorm Watch Until 9 P.M.